C&L to perform interior reconfiguration, paint and more on Embraer 145 family aircraft. BANGOR, Maine – C&L Aviation Services (C&L), a C&L Aviation Group company, has signed an agreement with JetSuiteX, Inc. to provide interior aircraft refurbishment, engineering, and exterior paint services to convert multiple Embraer 145 family aircraft from standard regional aircraft to the luxurious 30 seat JetSuiteX brand interior and distinctive red and white exterior paint scheme. This includes new seat designs, upgrading interior panels, upgrading lavatories, installing LED lighting, Wi-Fi, electrical outlets, and more. 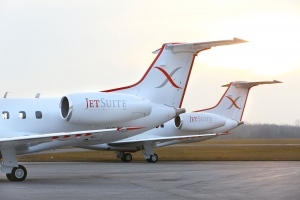 JetSuiteX’s luxuriously appointed E-135 jets can also be chartered for group trips, corporate events or other travel. For a custom quote, contact JetSuiteX at 800-IFlyJSX. For information, please visit www.JetSuiteX.com.